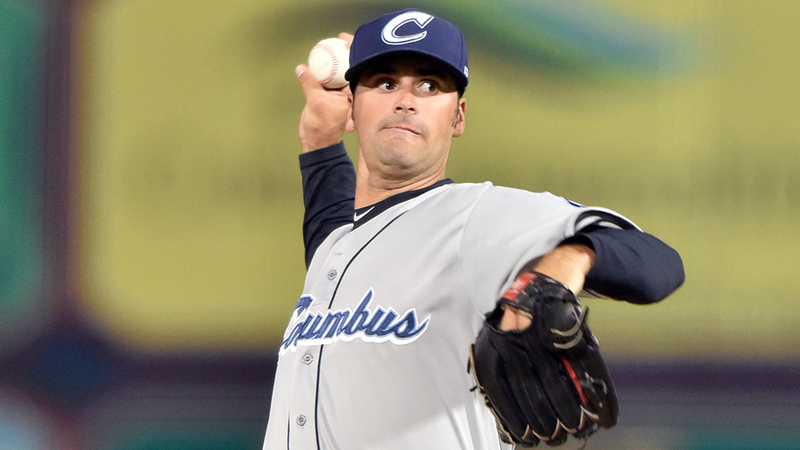 Once Adam Plutko got through his seventh perfect inning Saturday night for Triple-A Columbus, he began to deploy his best avoidance maneuvers on manager Chris Tremie. "Ultimately, it's [his] decision to leave me in or take out of the ballgame and I respect it completely," the Indians right-hander said. "I was just trying to make sure I was not seen or heard from because I definitely didn't want to come out of the game." Keeping his head down and staying out of his skipper's line of sight, Plutko fell two outs shy of perfection, spinning a no-hitter for the Clippers in a 6-0 victory over Syracuse at NBT Bank Stadium. He set down the first 25 batters before losing Bengie Gonzalez to a one-out walk in the ninth inning. "I threw a couple borderline pitches that ... honestly, they were probably balls," the 26-year-old said, recalling his six-pitch battle with the Chiefs shortstop. "He check-swung on the one, I wanted them to say he went around, but I think he didn't. I'd say it was a standup job by the umpires." Plutko (5-3) was four outs from perfection for the Clippers on April 28. He mowed down the first 23 batters before being pulled after his pitch count reached 95. Indianapolis catcher Jacob Stallings promptly doubled on the first pitch from reliever Neil Ramirez. "I've said this the entire time ... they're supposed to get hits. I mean, that's what they get paid to do," he said. "The pressure is not on me, it's on them to get hits. So that's kind of my mindset with it and really that's the extent of it. They're supposed to get hits." The no-hitter was the second in nine days for the Clippers after Indians No. 8 prospect Shane Bieber tossed a rain-shortened gem against Gwinnett on May 25. The last International League team to throw two no-hitters in a season was Indianapolis in 2012 when Justin Wilson was involved in both milestones, the first in a combined effort with Jose Diaz and Doug Slaten on April 29 and the second by himself on Aug. 9. Plutko made his last two starts in the Majors and has a 3.93 ERA in three appearances for the Indians this year. He carried a no-hitter into the seventh against the Cubs on May 23 at Wrigley Field and was optioned back to Columbus after struggling in his latest start, surrendering five runs on six hits over five innings against the White Sox on Monday. "I think my off-speed stuff was really good up there and it saved me," the Upland, California, native said. "What was hurting me was my fastball command. So when I combined the two the result is what it is tonight -- obviously, that's not going to be an everynight thing, but I married the two together and I was able to execute the pitches that I wanted to." Saturday night's start was the eighth of the season for the UCLA product, who lowered his ERA to 1.87 while boosting his strikeout total to 43 over 53 innings. "When I'm going right, it's fastball command, 100 percent," said the 2013 11th-round selection. "Even in my bullpen pregame [tonight], I thought it was pretty spotty and then I threw a couple in the game and it just clicked. That's right where I needed to be and I knew it and was going to ride that out for the rest of the game." Plutko benefited from a pair of difficult defensive plays by rehabbing big leaguer Lonnie Chisenhall. The right fielder, who was 1-for-5 in his eighth Minor League appearance since going down with a calf strain, tracked down fly balls against the fence in foul territory in the eighth and ninth innings. An exasperated Plutko saw the brilliant defensive plays as signs that the cracks were starting to show, and he was finally able to let out a sigh of relief upon striking out Jaff Decker to end the game. "I think they were starting to get to me, my defense was unbelievable back there and [catcher] Eric Haase called a great game," he said. "It was just, thank goodness it's over because there was a couple really good plays. ... [Chisenhall] doesn't need to make those plays, he needs to help Cleveland win ballgames." Top Indians prospect Francisco Mejia and 20th-ranked Haase both doubled and singled. Haase also scored twice and Brandon Barnes contributed three hits and two RBIs for the Clippers. Nationals No. 4 prospect Erick Fedde (2-2) started for the Chiefs and allowed five runs on 10 hits over five innings, striking out nine.